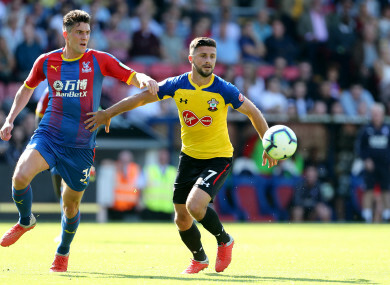 Crystal Palace's Martin Kelly (left) and Southampton's Shane Long battle for the ball. THERE WAS BAD news for Ireland boss Martin O’Neill today, as striker Shane Long was forced off injured during Southampton’s Premier League clash with Crystal Palace. Fellow striker Danny Ings had put the Saints ahead, before Long pulled up and was replaced early in the second half by Charlie Austin, who subsequently missed a penalty. The seriousness of the injury has yet to be confirmed, but the Tipperary native is now a doubt for Ireland’s upcoming Nations League clash with Wales on 6 September in Cardiff. It is a blow O’Neill could do with out, with the Derry native having already lost another striker, Sean Maguire, through injury. Speaking at the squad announcement during the week, the Ireland manager admitted the lack of options in attack was a problem for his team. Email “Bad news for Ireland as Shane Long goes off injured”. Feedback on “Bad news for Ireland as Shane Long goes off injured”.